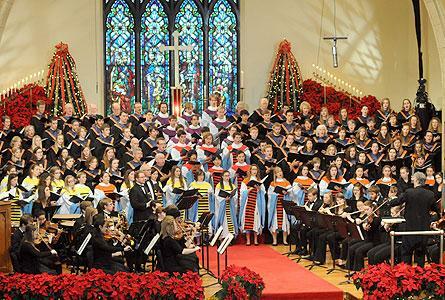 The television production of the 2013 Hope College Christmas Vespers service has been nominated for a Michigan Emmy Award. The program, produced by WGVU-TV in Grand Rapids in cooperation with the department of music at Hope, has been nominated in the “Arts/Entertainment” category in the 36th Emmy Award program of the Michigan Chapter of the National Academy of Television Arts and Sciences. The nomination recognizes WGVU Production Manager Philip Lane, WGVU Assistant General Manager Ken Kolbe and WGVU General Manager Michael Walenta. Dr. Brad Richmond, professor of music and director of choral activities at Hope, was artistic director of the 2013 Vespers. Christmas Vespers has been held at Hope College since 1941. The program of Christmas carols and anthems is presented by the college’s department of music and features more than 200 students in historic Dimnent Memorial Chapel. The 2013 services were held on Saturday and Sunday, Dec. 7-8. The WGVU production was made available to PBS affiliates nationwide for presentation during the holiday season. The service was first broadcast on WGVU in 1994 and is now filmed every two or three years. The productions have earned multiple awards through the years. The 2011 program received an “Award of Excellence” in the Video category in the 18th Annual Communicator Awards and was nominated for two Michigan Emmy Awards. The 2008 production won three awards, including a Second Place Silver Screen Award in the Arts: Music category from the U.S. International Film & Video Festival’s 42nd Annual Awards Competition; an Award of Distinction in the Arts category in the Videographer Awards competition; and a Bronze Award in the 30th annual Telly Awards competition. The 2006 production won an Award of Excellence in the 2007 Videographer Awards; a Silver Award in the 2007 Millennium Awards; and a Best Arts-Local Release Award in the 2007 Gabriel Awards. The 2004 production won a 2005 Michigan Emmy Award for Multiple Camera Field Directing, and Honorable Mention in the 2005 Videographer Awards. The winners of the 36th Annual Emmy Awards presented by the Michigan Chapter of the National Academy of Television Arts and Sciences will be announced during a ceremony on Saturday, June 14, at the MotorCity Casino Sound Board Theater in Detroit. Founded in 1947, the National Academy of Television Arts and Sciences (NATAS) and the Emmy Award stand for the best in the television industry. The National Academy is the only non-profit organization dedicated to recognizing outstanding achievement, raising industry standards, and improving the quality of television. Its dedication to excellence is pursued every day by members of its 19 chapters across the country. The Michigan Chapter was charted by the National Academy in 1978 as the Detroit chapter and Peter Kiezer was the first president. In 1989 the chapter was expanded to include the entire state of Michigan.